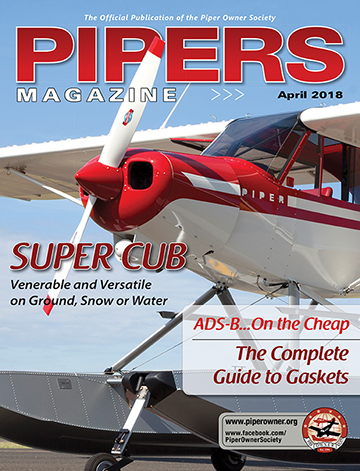 March was a sad month, and one of the worst in recent history from a statistical standpoint, as nine people died in five Piper accidents, including five on a flight involving a Piper PA 23-250, one involving a banner towing, and one involving a student who apparently took off in bad weather without endorsement. The operator reported that the pilot was scheduled to fly 2 hours on his first solo banner tow flight away from the banner tow box at HWO. He was towing a 30-foot-high by 90-foot-long “medium size” company banner. According to company personnel, after takeoff the pilot practiced pick-ups, then picked up the accident banner on the first pass about 1059. Review of company tracking data revealed that the flight proceeded due east to the beach where the pilot performed several passes near Hollywood Beach, then proceeded north. Federal Aviation Administration (FAA) radar data depicted the airplane flying in a northerly direction until about 1138; then while over water south of the Commercial Boulevard Pier, the pilot initiated a right turn and flew at an altitude about 400 ft mean sea level (msl) in a southerly direction until about 1140:12, when the airplane was south of Oakland Park Boulevard. Witnesses reported seeing the airplane turn right to a westerly or northwesterly direction and flying over land, while the FAA radar data depicted the airplane descended to about 200 ft msl. The airplane was observed to bank sharp to the left, during which time one witness observed the banner twist and separate. Another witness thought the left bank was the pilot’s attempt to fly over NE 30th Street between two tall buildings. The airplane was then observed banking to the right, and impacted into the 16th and 17th stories of a 19 story condominium. The airplane then fell to the 2nd floor deck and came to rest on its left side. Witnesses in different locations described the engine sound as either “sputtering,” “operating normally,” or “being at a low throttle setting.” A witness in one of the impacted units reported that the engine was operating at full throttle with no discrepancies. Read the report PDF here. On March 5, 2019, at 0703 eastern standard time, a Piper PA-28-161, N556PU, was substantially damaged when it impacted trees and terrain near Fellsmere, Florida. The student pilot was fatally injured. The airplane was registered to and operated by FlightSafety International (FSI) Inc. under the provisions of Title 14 Code of Federal Regulations Part 91. Instrument meteorological conditions prevailed at the time of the accident. No flight plan was filed for the cross-country flight that departed Vero Beach Regional Airport (VRB), Vero Beach, Florida, about 0657, and destined for the Palm Beach County Glades Airport (PHK), Pahokee, Florida. The student pilot had been training at FSI’s FlightSafety Academy (FSA) in Vero Beach, Florida. She was conducting her second solo cross-country flight. The airport’s control tower was not open at the time she departed, so the student pilot had to communicate her intentions via the airport’s common traffic advisory frequency (CTAF). There were recorded radio transmissions documenting the student’s departure. Under Federal Aviation Regulation 61.93c3, a flight instructor is required to endorse the student pilot’s logbook for each solo cross-country flight. A review of the endorsements section of the student pilot’s logbook revealed she was not endorsed by her instructor for the flight on the day of the accident. She had been endorsed by her flight instructor the day before the accident on March 4, 2019. According to flight instructor, the student was scheduled to complete this cross-country the day before the accident. The instructor had met with the student pilot and reviewed the weather conditions, the navigation log, and her flight planning. She then endorsed the student for that flight; however, the flight was cancelled at the last minute due to weather. The instructor then requested for the student to have a block of time in the afternoon the following day to complete the cross-country flight. FSA’s scheduling department was unable to book the flight for the afternoon and it was scheduled for 0600 the following morning. The instructor knew there was a high probability that the flight would not take place due to weather. When she did not hear from the student pilot the following morning, the instructor thought the flight had been cancelled due to weather. The instructor stated that the student pilot was aware that she needed to obtain her instructor’s endorsements before she could be released for the flight. On March 5, 2019, about 2204 central standard time, a Piper PA 28-180 airplane, N7369W, was substantially damaged when it impacted trees and terrain 4 miles northwest of Summersville, Missouri. The pilot was fatally injured. The airplane was owned and piloted by private individuals and operated under the provisions of Title 14 Code of Federal Regulations Part 91 without a flight plan. Dark night visual meteorological conditions prevailed at the time of the accident. The cross-country flight departed New River Valley Airport (PSK), Dublin, Virginia, at an unknown time and was en route to Downtown Airport (3DW), Springfield, Missouri. According to the owner of the airplane, the pilot traveled to Virginia on commercial airline flights the morning of the accident to fly the airplane back to 3DW. A receipt found by investigators indicated that the pilot stopped at London-Corbin Airport Magee Field (LOZ) and purchased 26 gallons on fuel at a self-service pump. He departed about 1800. The pilot of the airplane did not receive services, nor was he required to receive, services from air traffic control. A preliminary review of radar data illustrated the flight west-bound at an altitude of 5,000 ft msl. The airplane initiated a turn back towards the east before the radar track was lost. The wreckage was located the next morning by the driver of a vehicle on a nearby road. Pahokee Florida. The commercial pilot and four passengers were fatally injured, and the airplane was destroyed. The airplane was registered to L-Holding LLC, and operated by the pilot as a Title 14 Code of Federal Regulations Part 91 flight. Visual meteorological conditions prevailed at the time of the accident and the flight was operated on an instrument flight rules flight plan. The flight originated from the Tampa International Airport (TPA), Tampa, Florida about 1420 and was destined for North Palm Beach County General Aviation Airport (F45), West Palm Beach, Florida. The Federal Aviation Administration reported that the pilot declared an emergency to air traffic control and reported a rough running left engine. The pilot further reported that he was going to shut down the left engine and divert to PHK. The controller cleared the pilot to land; the pilot’s last transmission was when he reported the airport in sight. Witnesses reported that their attention was drawn to the airplane when they observed it in a 45o nose and left-wing low rapid descent before it impacted the water. The 62-year-old veteran pilot who died in the crash involving a Piper Navajo in Ohio in March knew the plane had been suffering from a fuel leak, multiple reports including the NTSB’s indicate. It was not immediately evident whether the pilot thought the problem had been fixed. The flight was apparently a commercial flight for an aerial photography company. On March 12, 2019, at 1516 eastern daylight time, a Piper PA-31-350, N400JM, was substantially damaged when it impacted terrain in Madeira, Ohio. The commercial pilot was fatally injured. The airplane was operated by Marc, Inc. under the provisions of Title 14 Code of Federal Regulations Part 91 as a commercial aerial surveying flight. Visual meteorological conditions prevailed, and no flight plan was filed for the local flight that originated from Cincinnati Municipal Airport-Lunken Field (LUK), Cincinnati, Ohio, at 1051.
controller noted a simultaneous loss of radar and radio contact about 5 nautical miles north of LUK. be isolated and repaired. The accident airplane remained parked for a few days, was not exchanged, and then the accident pilot was brought in to continue flying the airplane. model. His most recent logged flight review was completed January 31, 2017. According to FAA airworthiness records, the twin-engine airplane was manufactured in 1981. It was powered by two Lycoming, 350-horsepower engines, which drove two 3-bladed, constant speed, counter-rotating propellers. There is more detail about the crash in the NTSB report. Read or download it here.